Over the past year our Earl Grey selection has grown with 10 varieties now available to choose from you’re spoilt for choice! But, Earl Grey Tea doesn’t have to be confined to a bone china cup at breakfast time. It can be used for a whole variety of wonderful cooking ideas! 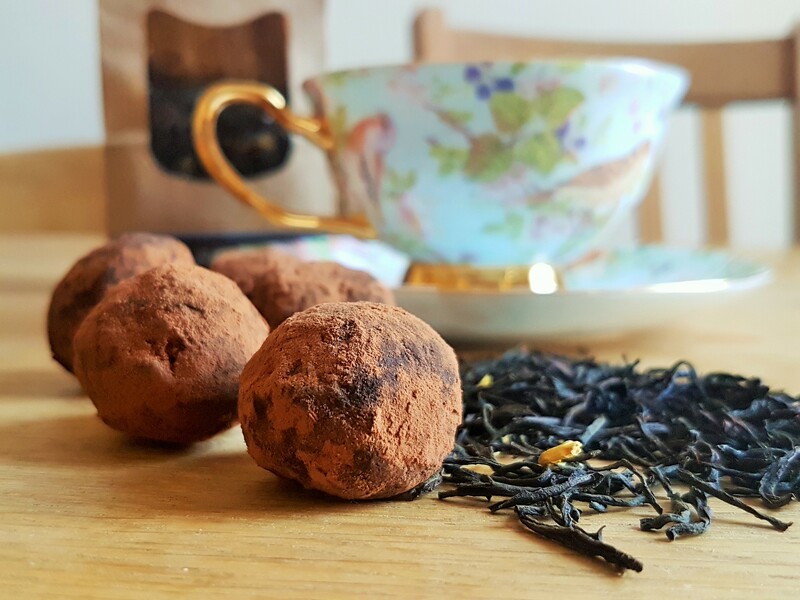 Over the years Tim has experimented with making truffles using tea as a flavouring and has come up with the ultimate Earl Grey truffle recipe! I (Sarah) am not an experienced cook by any means and was set the challenge of following Tim’s recipe. The only difference is that I chose to use Earl Grey Imperial tea instead of our regular Earl Grey tea as I love the additional jasmine flavour! Gently melt the butter with the earl grey leaves. Once melted sieve off the leaves. Gently heat the cream in a saucepan until it comes to a simmer. Add the melted butter and stir. Shortly after, add the chopped chocolate. Stir until melted. Remove from heat and pour the mixture into a shallow dish. Chill in the fridge for at least 2 hours, until firm. Roll the mixture into 2 to 3cm balls. For best results, use a melon baller, though a small teaspoon can also be used. Roll each ball in the cocoa powder. Even an inexperienced cook like myself was able to make these delicious truffles! Experiment yourselves with our different flavours of Earl Grey! Prefer something more rich and citrusy? Try using our Miss Grey blend with bergamot and added orange blossom. Or maybe you’d prefer our Rose Earl Grey for that delightful floral flavour! Let us know about your experiments and successes and most of all: Enjoy Yourself!